As China’s economy has grown, so too has its role in world affairs. An increasingly assertive China has challenged the geopolitical balance of power in Asia and extended its economic reach in Africa, Latin America, Europe and elsewhere. The Chinese people recognize their country’s growing prominence: 75% say China is playing a more important role in world affairs than it did 10 years ago. 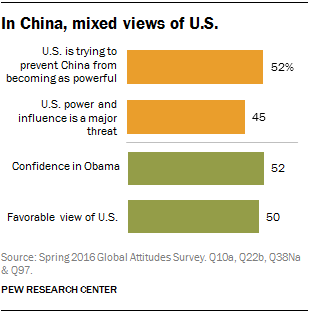 Only 10% of the Chinese believe that they are a less powerful player in the global arena. China has benefited greatly from economic globalization, and most Chinese (60%) believe their country’s involvement in the global economy is a good thing; only 23% think this is bad for China. Such self-confidence about China’s international stature coexists with some degree of anxiety and a general tendency to look inward more than outward. A majority of Chinese (56%) want Beijing to focus on China’s problems. Just 22% voice the view that their government should help other nations. And there is widespread unease about the impact on China from the world around them. Roughly three-quarters (77%) of the public believes that their way of life needs to be protected against foreign influence, and such sentiment is up 13 percentage points since 2002. Moreover, about six-in-ten Chinese (59%) are concerned that territorial conflicts between China and neighboring countries could lead to military conflict. The United States, another principal actor on the world stage, gets mixed reviews in China. Half give the U.S. a favorable rating, while 44% offer a negative one. But 52% think the U.S. is trying to prevent China from becoming an equal power; only 29% believe the U.S. is willing to accept China’s rise. And the Chinese public names U.S. power and influence as the top international threat facing the country. Just under half (45%) say the U.S. is a major threat – the highest percentage among the seven potential threats tested on the survey. The preference to look inward accompanies widely shared public worries about the domestic challenges facing the country. In particular, official corruption is a major concern. President Xi Jinping has made fighting corruption a centerpiece of his time in office, leading to the arrests of many Communist Party officials. Roughly half (49%) the Chinese public says corrupt officials are a very big problem in the country, while another 34% believe they are a moderately big issue. Inequality is also a top worry. Even though it has slowed somewhat over the past couple of years, China has enjoyed remarkable economic growth in recent decades. But there is a perception that the spoils have not been shared equally. Thirty-seven percent consider the growing gap between rich and poor a very big problem, and 40% believe it is a moderately big problem. With its growing middle class, many Chinese are worried about issues such as consumer and environmental safety. In recent years there have been numerous high-profile scandals regarding unsafe medical and food products, and the Chinese public is taking note. The share of the public rating the safety of medicines a very big problem has risen from 9% in 2008 to 42% today. 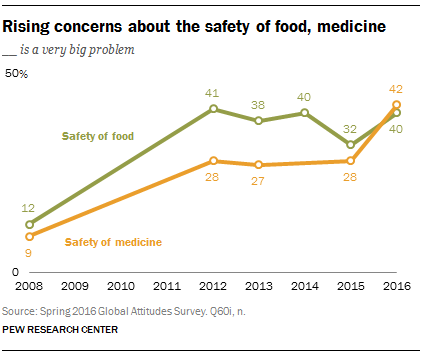 Similarly, strong concerns about food safety have grown from 12% to 40%. Meanwhile, more than three-in-ten say water and air pollution are very big problems, and about seven-in-ten consider them at least a moderately big problem. Moreover, many Chinese are willing to make tradeoffs to address environmental challenges. Half of those polled believe China should reduce air pollution even if it means slower economic growth, while just 24% think air pollution is the necessary price of a growing economy. Still, many Chinese expect to see improvements on the country’s major challenges. This is especially true of corruption – 64% expect progress to be made on corruption in the next five years. More than four-in-ten believe there will be progress on food safety and air pollution. And the Chinese public remains upbeat about the country’s economy. Almost nine-in-ten think the economy is in good shape and 76% expect it to improve over the next 12 months. They are slightly less optimistic about their personal economic fortunes, though still largely positive: 63% say their personal economic situation is good and 70% believe it will improve over the next year. These are among the key findings from a Pew Research Center survey in China, conducted among 3,154 respondents from April 6 to May 8, 2016. 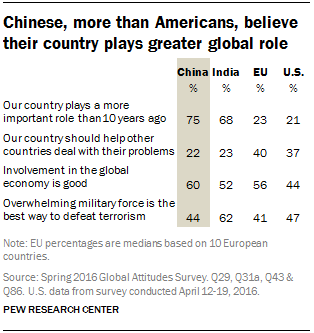 The Chinese (75%) are far more likely than Europeans (23%) or Americans (21%) to believe that their nation plays a more important role on the world stage today than it did a decade ago. Notably, Indians (68%) are similarly confident when it comes to seeing their country as more influential in global affairs, compared with a decade ago. The Chinese (60%) resemble the Europeans (56%) in their embrace of global economic engagement, and are more upbeat about their involvement in the world economy than either Indians (52%) or Americans (44%). When it comes to dealing with developing nations, Chinese views are generally more favorable than those in the U.S. A majority (55%) of Chinese support importing more goods from developing countries. This compares with a median of 64% of Europeans and 52% of Americans. Two-thirds of Chinese (67%) favor increasing Chinese companies’ investment in developing nations. Roughly three-quarters of Europeans (76%) back their firms investing more in Africa, Asia and Latin America, while only about half of Americans (52%) support such business activities. And about six-in-ten (62%) Chinese support increasing China’s foreign aid to developing nations. This share in favor of increasing foreign assistance is higher than the 53% of Europeans and only 48% of Americans who hold the same view. China is one of the world’s leading military powers, but the Chinese people are not any more eager than Americans or Europeans to believe that the use of overwhelming force is the best anti-terror strategy. Just 44% of Chinese say this, comparable to the views of both Americans (47%) and Europeans (41%). Indians differ: 62% back employing overwhelming military force as the best way to defeat terrorism. The Chinese are, however, notably more inward-looking than either the Americans or the Europeans. 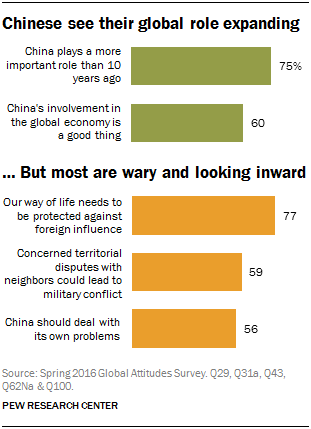 Just 22% of Chinese say their country should help other nations deal with their problems. This is comparable to the Indian view (23%), but far less internationalist than the opinion of either Americans (37%) or Europeans (40%).